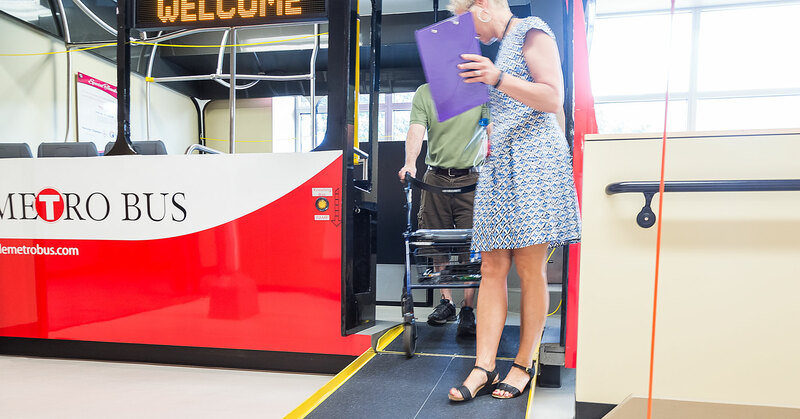 Metro Bus Dial-a-Ride is a shared ride service for individuals with disabilities who are unable to ride Fixed Route buses & require door-through-door driver-assisted service. Certification and advanced reservations required. For Dial-a-Ride users with speech or hearing impairments or for medical return appointment schedulers, this feature will allow you to chat with a dispatcher to schedule, change or cancel a ride. Complementary paratransit service is available within ¾ of a mile of all Fixed Routes seven days a week. Dial-a-Ride operates comparable hours to Fixed Route. Specific times vary by geographic area. There is no service on New Year’s Day, Memorial Day, Independence Day, Labor Day, Thanksgiving Day, and Christmas Day. Service ends early on Christmas Eve. Reservations and changes to reservations are accepted. *During weekdays, staff is available to answer calls regarding cancellations and questions until 8:00 pm and voicemail for cancellations will be checked until 8:00 pm. Accessible formats of the application are available by request by calling 320.251.1499 or email info@stcloudmtc.com. Uses a personal oxygen supply or ventilator. Metro Bus Dial-a-Ride does not provide services to those requiring external life support equipment or emergency medical transportation. Passengers utilizing transportation services offered by Metro Bus have an expectation of privacy. Metro Bus respects the privacy of its passengers and will not share any passenger information with others without expressed written authorization to release such information from the passenger. We realize agencies and/or other individuals may contact Metro Bus on behalf of customers for various reasons such as to schedule or cancel rides, discuss and appeal no-shows, discuss changes in mobility and/or discuss incidents or accidents that occur on the bus. If customers wish to allow Metro Bus to speak with anyone other than them regarding their use of Metro Bus services, the passenger must complete the Passenger Release of Information Authorization Form and return to Metro Bus. Forms can be faxed to 320-257-4583, emailed to MBpassrelease@stcloudmtc.com or mailed to Metro Bus Mobility Training Center, 700 West St. Germain, Suite 100, St. Cloud, MN 56301. Year-round and under any condition. Under certain conditions based on a disability. When a disability is temporary for a limited, specific amount of time due to post-operative recovery, broken bones, etc. When residing outside the Metro Bus service area and meeting eligibility criteria allows use of Dial-a-Ride within the service area. When visiting and staying in the Metro Bus service area. 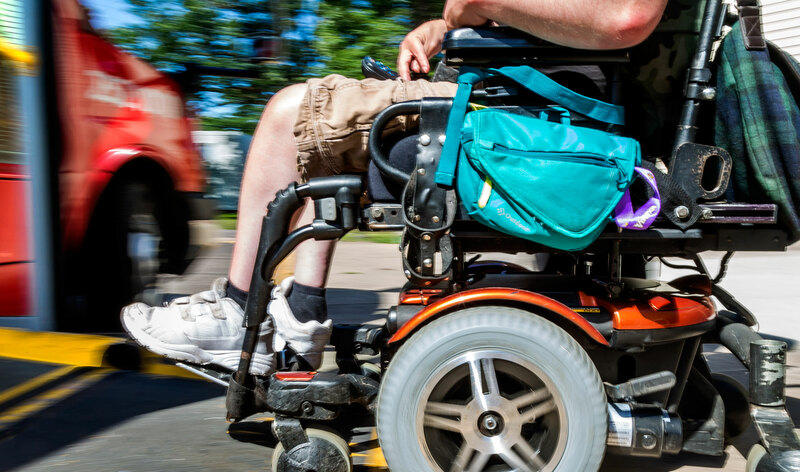 Must prove eligibility by presenting an identification card from their local public transportation program, or prove mobility impairments, such as use of a wheelchair or other mobility aid. Using the service longer than 21 days in a 365-day period of time requires completion of an application. Will receive an identification card that includes name, certification type and expiration date and the Dial-a-Ride guide. Changes in disability status or address change must be communicated to Metro Bus. If an applicant is denied certification or recalled, the person may reapply if there are substantial changes in physical or mental capabilities. To schedule a ride, you must be certified. Trips may be scheduled up to seven days in advance. Every effort will be made to schedule trip requests at the specific time desired. Earlier or later pick-up times may be suggested due to system capacity limitations. All trips are scheduled to carry as many passengers as possible. Wait at the outer door of your designated pick-up location at the time provided. Return trips for medical appointments can be scheduled when the initial ride is requested or can be called in when your medical appointment is completed. Allow at least 15 minutes beyond the pick-up time before calling about the ride. Drivers do not take appointments or make changes. Dial-a-Ride does not provide emergency medical transportation. A companion is a family member or friend who rides along. More than one companion may ride if there is capacity on the vehicle. Each companion must pay a fare each time they ride and must board and exit at the same location as the rider. When scheduling your ride, inform the dispatcher of any companions you wish to ride along. A family member or friend serving as your personal care attendant (PCA) isn’t considered a companion. Subscription Service requests are reviewed the first Monday of each month and the five working days following. Approval is based on meeting the set criteria, as well as the availability of service. Subscription trips may be put on hold for up to 30 days. If a rider does not resume subscription trip within 30 days, it will be removed and rescheduled through the subscription trip request process. Subscriptions have no expiration. If there are any changes made to the subscription (day, time or destination) it may be canceled and will be reinstated, if there is availability. If a rider cancels 50% or more of their trips in the month, subscription service may be removed. A Personal Care Attendant is someone who provides care for the certified individual and is necessary to the individual’s mobility. One PCA can accompany a certified Dial-a-Ride rider at no charge. An individual’s certification should indicate he or she may, at times, require a PCA. When you schedule your ride, inform the dispatchers if your PCA will be accompanying you. The PCA must board and exit at the same locations as the rider. Trips must be cancelled as far in advance as possible. If a scheduled trip will not be used, it must be cancelled at least two hours in advance to avoid a no-show. Once an application is received, we will contact the applicant to schedule an in-person interview. This interview will be conducted at the Mobility Training Center, located at 700 West St. Germain Street, Suite 100, in downtown St. Cloud.